Pininfarina has returned to Japan with its acclaimed Nido concept car from five years ago, which is the guest of honour of ZIG ZAG – Tradition, Innovation: Italy towards the future an exhibition being held in Tokyo which is running until 17 October as part of the festival, Italy in Japan 2009. 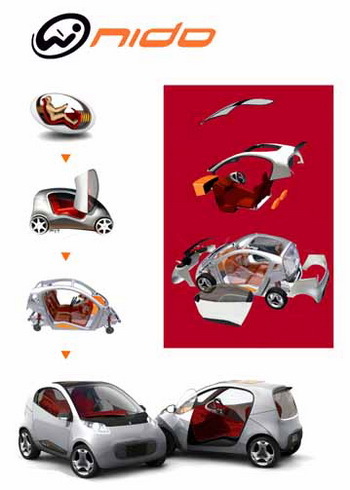 In the Pininfarina Nido concept, design and safety come together under the banner of aesthetics, functionality and technology, a combination that won the Compasso d’Oro ADI award in 2008 in the section dedicated to projects which anticipate new trends in transportation design. 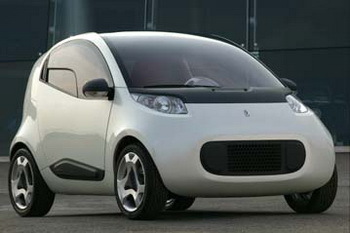 In 2004, the year when it was presented at the Paris Show, the Nido had also won The Most Beautiful Car in the World prize in the prototypes and concept cars category. Then in 2005 it was exhibited for three months at the MoMA of New York on the occasion of the SAFE: Design Takes on Risk exhibition. 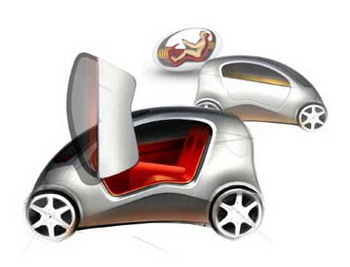 The Nido project is based on the study, design and prototyping of new solutions involving the structural and design aspects of a small 2-seater vehicle, the purpose of which is to boost safety. The Nido hosts and protects passengers through three main features: a chassis consisting of a deformable front section and a rigid safety cell around the occupants; a shell that holds the driver and passenger and acts as a sled, able to slide horizontally on a central runner; two absorbers which dissipate residual energy by means of a honeycomb structure. Hosting the Nido in Tokyo is the ZIG ZAG – Tradition, Innovation: Italy towards the future exhibition, one of eight main events of Italy in Japan 2009 festival (1 September-31 December 2009), whose aim is to consolidate the integrated promotion strategy of Italy Inc. and present Italy’s points of productive, scientific and technological excellence, together with the country’s extraordinary cultural, artistic and tourist appeal. Specifically, this exhibition forms part of a wider context of the "Inter-regional promotion project for the engine-related mobility and sub-supply sector in Japan 2009” organised and supported by ICE (the Italian foreign trade body) and by the Italian regions of Emilia Romagna, Lazio, Lombardy, Piedmont and Apulia. The exhibition - of which ANFIA is partner in the organisation involving its associated companies from the five regions above mentioned - will be mounted in Tokyo at the Nippon Kagaku Miraikan National Museum of Emerging Science and Innovation. “We have close ties with Japan”, commented Chairman Paolo Pininfarina, “and with its industry with which over the years we have developed prestigious cooperation agreements, like the one with Honda. A number of our vists to the Tokyo show have been memorable: I am thinking of the 1989 edition at which our Ferrari Mythos concept won the Golden Marker Trophy, or that in 1995, when our Honda Argento Vivo two-seater convertible débuted with great success. One reason for great satisfaction is the fact that the Nido, thanks to its strong technological innovation content, has been invited to the Italy in Japan 2009 event to represent Italian excellence and the innovative aspects of the Italian engine and advanced mechanical sector."